rpi-update to get it. Consider this beta for now. This takes about fifteen minutes. You need to have camera enabled and sufficient gpu_mem configured (much like raspicam). In theory (some) apps that use V4L should work. Report back what does work and what doesn't. Thanks to Vincent Sanders at Collabora, and Luke Diamand and David Stevenson at Broadcom for working on this. Last edited by jbeale on Mon Dec 02, 2013 9:10 pm, edited 3 times in total. to get the autoreconf command. Thanks - added to instructions. Last edited by jbeale on Mon Dec 02, 2013 9:12 pm, edited 1 time in total. jbeale wrote: Do you get the same undefined macro: AM_ICONV error that I see? Is there another file I'm missing? No it worked for me, but I've installed lots of things in the past. first, to install the older v4l2 tools which may get some required dependencies. Then try building the newer code. This same error was reported by 'subnet' back on 14 Jul 2013 when attempting to compile i2c-arduino in this post. Unfortunately no one has since replied to that post. EDIT: There may be some naming conflict if you have previously done 'sudo apt-get install libi2c-dev' which I think is where /usr/include/linux/i2c-dev.h came from? investigating... confirmed. I was able to fix that error by executing 'sudo apt-get remove libi2c-dev'. I suppose you would not have the error if you had not previously installed libi2c-dev. Last edited by jbeale on Mon Dec 02, 2013 10:55 pm, edited 2 times in total. Re: Official V4L2 driver. Success! Got it working. After 'sudo modprobe bcm2835-v4l2' and 'v4l2-ctl --overlay=1' I see the live camera view in the background of the console. My particular conflict with the struct i2c_msg definition was fixed by 'sudo apt-get remove libi2c-dev' and probably most people will not see it because they hadn't installed that header file. Now the standard 'motion' package works, and is able to save JPEG files at roughly 30 fps at a resolution of 352x288 (with CPU nearly 100%). That was never possible with the RPi-specific motion-mmal program which I found was limited to a much lower frame rate even at very low resolutions. It can also run at 1280x720 at 5 fps but it can only save JPEGs at about 1 fps at that resolution, as it is doing the JPEG encoding on the ARM. I get a detection latency of about 140 msec at 64x32 pixels 30 fps with about 2% CPU (not saving any files, just pulsing a GPIO output from the on_event_start line). Last edited by jbeale on Tue Dec 03, 2013 1:41 am, edited 2 times in total. Motion works using the YU12 format output. It does not work if you select the JPEG format output instead of YU12 in the motion.config setup file. If I try it with 'sudo motion' then I get a crash. to reconfigure the configure.ac for the m4 macro error above? Sweet! I've been waiting for this. Gonna test soon. Why does it say "Authored 10 months ago" on GitHub? Noob question: Why do I want this? What does it do? It's a kernel driver that is written according to the standard video2linux specification. Most software on Linux requires video4linux drivers. The cludge with piping video to other software is unnecessary now. Provided it works properly. And proper timestamps allowing VFR, and easy muxing, e.g., with gstreamer. I wonder if they sorted out full-frame video. How to check it was installed ok? towolf wrote: I wonder if they sorted out full-frame video. No, that's a GPU side issue, nothing to do with the Arm side code. fernandovg wrote: How to check it was installed ok? If you don't see any error messages and find a valid JPEG file "test1.jpg" in your current directory, then the driver is installed and working. So far I have the new V4L2 driver installed and working on two different R-Pis, so that is good. The apt-get version of motion ( Version 3.2.12, Copyright 2000-2005 ) works, at least in the default 'YU12' mode, although not in 'JPEG' mode so far. I notice that many jpeg images saved by motion appear somewhat overexposed, for some reason. 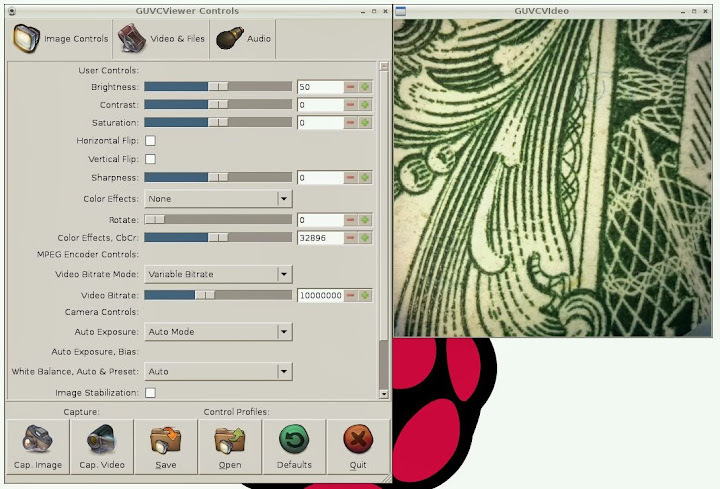 The raspicam and raspistill applications have a lot of control over camera parameters like ISO, shutter speed, etc. Is that level of control possible through v4l2-ctl or other interface? If so, an example of the command would be great. Normally you can enumerate the controls a v4l driver exposes. Does this v4l tool have a command line option like "list controls"? Last edited by jbeale on Tue Dec 03, 2013 5:54 pm, edited 2 times in total. I don't know if guvcview is available on raspbian. It's a GTK GUI program that allows you to control the stuff with sliders. guvcview -o just shows the controls with no preview. exposure_auto and exposure_absolute would be interesting. And white_balance_temperature. And we need to document the settings the numeric values correspond to. Yes, it works, at least somewhat. I notice when guvcview is running, the CPU is pegged at 100% (75% guvcview and 21% Xorg), I guess rendering the live update window at 480x480 25 fps takes all the CPU. There is a two-option setting for "Auto Exposure" which is either auto or manual. However in "manual" mode there are no actual manual controls to set. Setting manual exposure does lock the exposure to the current settings, so subsequent darker or brighter scenes can go to full black or full white. There is a long list of "Color Effects" like Emboss, Solarization etc. which do work. The "Cap. Image" button does capture to "Image.jpg" in the current directory. If you scroll down in the controls window (hidden in screen cap above) there is an item marked "JPEG Compression Controls:" but it is blank, there are no actual controls shown. If you select the "Video and Files" tab there is a "Resolution:" pulldown menu but 480x480 is the only item available. Likewise, there is a "Frame Rate:" menu but 25 fps is the only option. There is a "Camera Output:" menu set to YU12. It offers the options YU12, YUYV, BGR3, JPEG, RGB3, YV12. The BGR3 and RGB3 modes work. If you select YUYV or JPEG it crashes with Segmentation fault. You also get a segfault just by quitting normally ("Quit" button). Unable to enumerate frame sizes.